As you probably read in last week’s Sunday Times, the Egyptian government may now regret having killed all the pigs in Cairo in a misguided effort to prevent the spread of Swine Flu. With no pigs to feed, the Zabaleen have no reason to go door to door collecting food scraps anymore, which means more trash ends up in the streets. 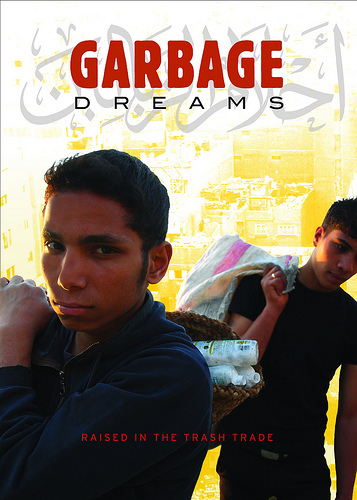 Filmmaker Mai Iskander emailed me after the piece ran to remind me that her documentary Garbage Dreams about three young men growing up in Cairo’s trash picking community touches on one of the core issues of the day: source separation. It’s an interesting lens to put to the developed world. What distinguishes modern countries from those struggling to “catch up” isn’t just the fact that we have high-tech recycling facilities, it’s that we are more or less willing to sort our trash in our own homes. The Zabaleen hope that by encouraging their neighbors to pre-sort trash, they can hang on to a piece of the profits from the waste industry before foreign waste hauling companies eclipse the need for local trash pickers. And it looks like their campaign is finally getting some buy-in from local authorities. Sadly, there no longer seems to be much call to sort out food waste as well. Let’s hope the increased trash in the streets at the very least serves as a political tool encouraging Egyptians to think about what happens to trash after it leaves the home and what they might do to reduce waste and recycle more. This entry was posted on Friday, September 25, 2009 at 11:12 am and is filed under TRA$H, Trash Politics. You can follow any responses to this entry through the RSS 2.0 feed. You can leave a response, or trackback from your own site. Another documentary, “Marina of the Zabbaleen”, was just released in select theaters and on DVD. The film is about a 7-year-old girl (Marina) who lives at the base of a mountain in Cairo, Egypt. Her village (Muqqattam) is a community of Zabbaleen — or Zabaleen 😉 — whose entrepreneurial waste management system produces the highest recycling rate in the world. It premiered at the 2008 Tribeca Film Festival, won a Muhr Award at the 2008 Dubai International Film Festival, and was reviewed by The New York Times – http://movies.nytimes.com/2009/09/09/movies/09marina.html. It’s also the first feature film to use a new eco-friendly DVD technology (the “Flex DVD”), which uses 50% less plastic than traditional DVDs, reduces the carbon footprint by 50%, and eliminates the need for a non-biodegradable bonder. Also, the rest of the packaging is made from 95% recycled materials. ALSO, the marketing campaign for the film has been completely paperless. There’s some more info about the film and the Flex DVD at http://marina.torchfilms.com. Oh, and the company that’s releasing “Marina” (Torch Films) is giving 10% of gross revenues to help the Zabbaleen recover from their dislocation (caused by the pig cull).